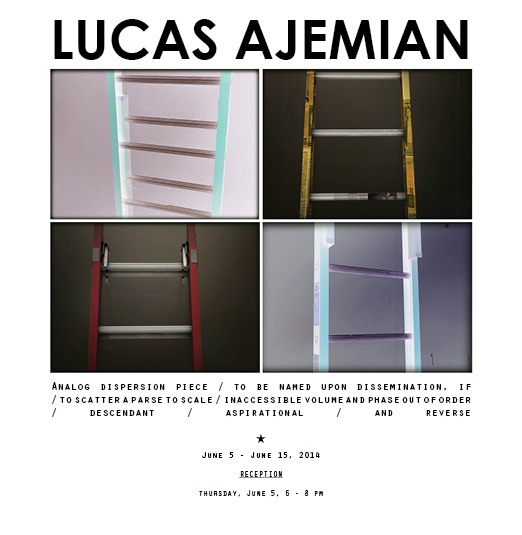 INVISIBLE-EXPORTS is pleased to present a ten-day installation by Lucas Ajemian, on view at the gallery from June 5 through June 15, 2014. 1. A 16mm film depicting a ladder constructed digitally through 3D animation. Over the course of several days, this film will be cut into various sections, many of which will be looped, and on view. The rest will be individually packaged for sale for $20 per foot. 2. Cut sections of ladders, projecting from the wall will act as analogous reversals to the film. Presented here are two elements of a concept: the willful confusion of sculpture as film, and the vice versa. Structural specters? Durational objects? Lucas Ajemian remains ambivalent. What he aims to explore here is an act of dispersion, through a casting out of segments from a single work. Deemed by the artist as in progress, the installation is a series of loosely defined actions and transactions until the moment of its dissolution, or rather, its dismemberment; its scattering, as fragments or souvenirs. Artworks, like their authors, lovers, collectors, and critics, only ever touch the contours of a concept. The object can be owned and exchanged, but its idea cannot be. Though it may seem hidden or obscured, its place in a discursive or historical context is accessible to all. Moreover, an idea is rarely, if ever, without precedent. The attempt to embody this lesson is something to indulge in from time to time. Lucas Ajemian (b. 1975) lives and works in New York. His work has been exhibited in galleries and institutions, both domestically and internationally, including INVISIBLE-EXPORTS, New York, NY; Marlborough Broome Street, New York, NY; LTD, Los Angeles, CA; Galerie Parisa Kind, Frankfurt, DE; Kirkhoff Contemporary Art, Copenhagen, DK; Galerie Iris Kadel, Karlsruhe, Germany; Palais de Tokyo, Paris, FR; Marlborough Chelsea, New York, NY; ICA Philadelphia, Philadelphia, PA; Galerie Emanuel Layr, Vienna, Austria; Moderna Museet, Stockholm, SE; and U-Turn Quadrennial, Copenhagen, among others. His works are in the collections of the Museum of Modern Art, New York, Moderna Museet, Stockholm and Hearning Museum of Art, Hearning, DK as well as numerous private collections. e coded narratives of consumer culture had not yet been made to seem, by a new flood of media, impossibly quixotic; and when it still seemed possible, in a sea of images, to make a personal and idiosyncratic claim.